The absurdity of Katie King running for any office, much less a judgeship, has reached new lows. Her dad Metro Council President is aware and knows the law. Today at page one What Are Katie King’s People Thinking?#comment-26942. Kudos to Jake for bringing this to our attention. How pathetic is Katie King and her Dad? Well if you look at the picture you will note the officers are in uniform which is a violation of law. KRSC.317(4) - No officer covered by the provisions of KRS 67C.301 to 67C.327 shall foster, promote, or be concerned with any actions involving political or religious controversies or prejudices while in uniform. According to LMPD spokesman Detective Russell these are NOT pictures of LMPD officers. 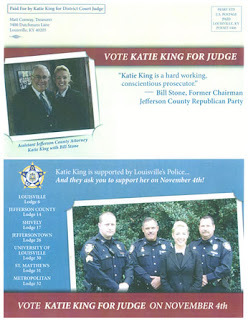 Does anyone else have a problem with the layout saying Katie King is supported by Louisville Police? By illegally using these photos and IMPLYING these are LMPD officers once again she is willfully LYING to the voters. This is intentional misrepresentation by her and yet another violation of law from someone who wants to Judge others. 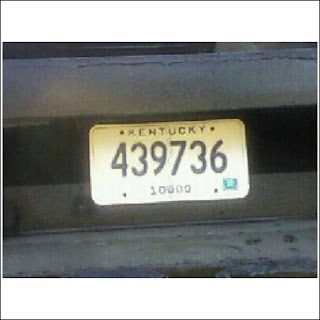 Remember she has already been found in violation in August: Louisville News and Politics: KATIE KING: Are you serious? This is a slap in the face to LMPD and all of us who expect better from potential judges. Katie King is on an ego trip aided and abetted by her dad, Metro Council President Jim King, it would seem. She seems to be in enough trouble to worry about her job so I guess the next best thing is for daddy to buy her the Judgeship so she is the boss and not accountable. Of course the illegal "damage" is done. Regardless of what happens at this point the mailer has been out. So what happens now? Very little. When found guilty she will be fined and daddy will pay the fine. No biggie for them. I am sure Jim King is having a great laugh over this. He knows this is in violation but it goes to show how low they will sink to protect poor silver spoon fed Katie from the big bad bosses who want her accountable as all employers should. We do not need this in our Judges. The King bandwagon needs to stop now. This is exactly the kind of hypocrisy we need to get rid of. Henderson, Norman Pepper, and Jack Wood love to take a couple vehicles and park them in lots for a day or two in violation of IPL rules. Why do I mention Jack Wood as well? Simple these guys think they are above the law. 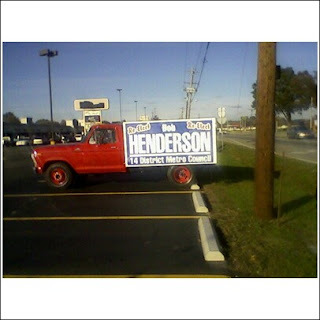 It is a pretty good summary of Bob Henderson in District 14. Next is Norman Pepper. Pepper has been a solid small businessman in this community for many years. I have even sided with Pepper publicly on the story of IPL trying to get rid of his fish. I even went to Code enforcement for a hearing to testify on his behalf. This case is a good one and I believe Pepper should win ultimately. This does not a Councilman make however. Pepper has shown time and again if it affects him he gets angry. We all would. The problem is that is the only reason Pepper is running. When you ask Pepper about issues he literally is clueless. When asked about the most pressing thing in the District and Louisville all he will speak about is the price of corn and barley. Good thing? Sure on a national level where it actually makes sense to attack the issue of pricing. 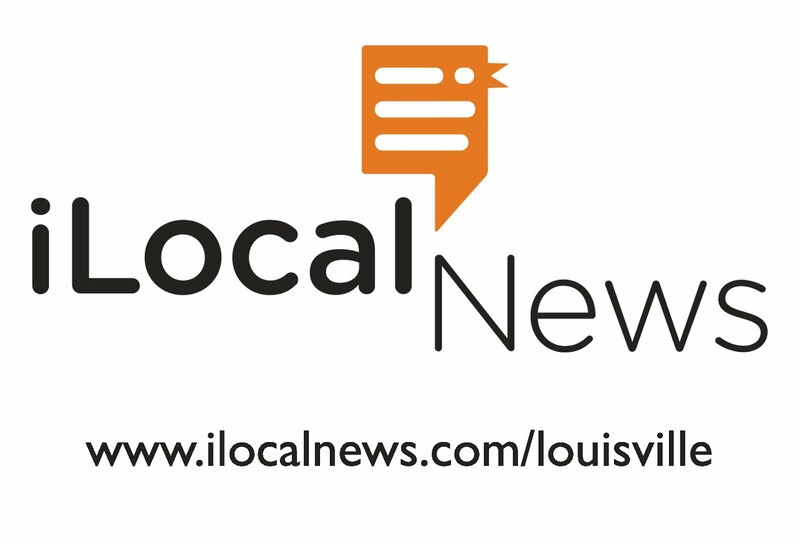 There is absolutely NOTHING, however, in this issue that affects the City of Louisville or the District in any significant way. When you speak to Pepper about any other issues there is literally nothing he can say. He has no clue whatsoever about how Government works and no clue on what to do if elected. His biggest concern is saving wildlife, and nature. Though a worthy goal Pepper will not be taken serious if elected and has no input whatsoever on how to make things better for the average citizen. In many ways seems like Pepper may have some memory problems IMO. That doesn't bode well for gaining any respect for the District to help make the changes necessary to be included in this Metro Government. Now Jack Wood, or he will say his daughter, what can be said. Jack came to Louisville with a load of baggage behind him. A lot of people do not know the real Jack Wood's politics, and even less of his 23 year old fresh out of college daughter, nor much about his background so I will fill in some slots. If they did it would be a surprise he could even get votes. Aside from moving here AFTER being investigated for arson on his own property Jack has not remained unscathed here politically either. Jack will do whatever he can to get an elected position and will use whoever he can unethically or otherwise to get there. He has NOT allowed anyone to talk with his daughter about her stance on anything, and the only thing Jack will say is that she is young and pretty so this qualifies her. There is literally nothing to go on. No one has ever seen her or heard her speak about anything whatsoever in regards to the issues of District 14 or how she will effect the City if elected to the Metro Council. He recently sent a mailer to Democrats homes in District 14. Did it say anything about her issues? Nope nothing,nada, zilch. Just a couple of home photos "dumbing down" the way she normally portrays herself and a UK and UL calendar. Are we this stupid we do not deserve content from someone seeking office? Apparently Wood thinks so. As a lawyer Jack Wood has been sanctioned by the bar, been a one time Circuit Judge twice disciplined for election deception, one who changes parties at will to try and get elected, and seems to have as his primary income NOT a law office, but a tiny Carpet sales business and a few rental properties on Dixie Hwy. IS this someone who can be trusted? Since Jack will not allow us to judge his daughter's credentials on issues stances than we must by default look at his since he is trying to get her elected for his gain in my opinion. With this in mind it is important to look at Jack's history in politics. One question that begs an answer from the party faithful, Jack which party are you a member of this year? There was a great interview on John Ziegler show at WHAS in 2002 where Jack admits he joins a party because that is the majority of voters in the district. Sad to know it isn't about substance but how you can screw the people into thinking you may be something you are not? The answer of course would be whichever one will get him elected or appointed to a City paying job. Well at least for 2 years. In the absence of that I guess now he wants to push his daughter into something she obviously has not shown, or been allowed to show, she wants to do so he can become her Legislative Aide ( a paying position) or power behind the throne, so to speak. Let's look at Wood's claim to being "our" C District commissioner. Wood ran for "C" District commissioner on a write in campaign for a job that had NO DUTIES AND NO RESPONSIBILITY for the position. It was a unique situation that should have been dissolved by merger but could not be overlooked for constitutional reasons. Jack ran as a write in, against you guessed it another write in, candidate for a defunct NO DUTY position and still almost lost essentially to himself. It was so close we had to spend $5000 to count the vote. Talk about wasting the taxpayers' money. It cost $5,000 to determine which of two write-in candidates for "C" District commissioner in Jefferson County got the most votes. He allowed us to waste $5000 of our tax money for a job that had no duties, no responsibilities, no pay and in short did nothing. Why? For his own ego and to make people believe he was in a position to do something for them when he could not. Deceptive? You be the judge. This should be a two person race, and not even on the ballot but for the brazen efforts of Jack Wood. Paula Sherlock and Susan Swope Atkins should come in one and two, and hopefully the voters will have tired of the antics of Wood and hit him hard enough to keep him in the 'wood shed'. Jack Wood, a lawyer who’s running for Jefferson County family court judge, wanted a judge to disqualify his competition. He sued his two opponents, claiming they didn’t file their papers correctly, in part because they wrote “10th” instead of “Tenth” to identify the court seat. But in the end, all Wood got was a judicial scolding and an order to pay the legal fees of his opponents — incumbent Paula Sherlock and Rebecca Swope Atkins. Willett noted that the only filing petition that wasn’t clear was Wood’s, since it appeared Wood checked boxes saying he was running for both circuit court and family court. A one-time District Court judge in rural southern Kentucky, Wood twice was disciplined for alleged deceptive election advertising in the early 1980s. He also feuded publicly with his court clerk and a former law partner. To quote Greg Stumbo from that article: "If I had a record like Jack Wood, I'd be ashamed,"
---------- From Bluegrass Report March 2006: BluegrassReport.org: Not HIM Again? 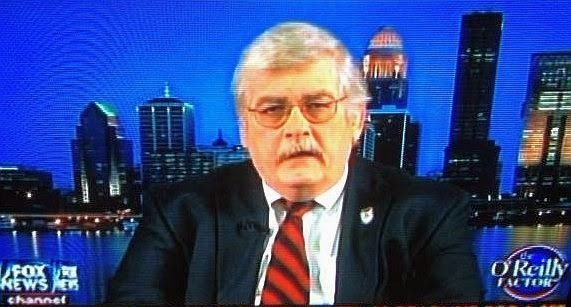 Of all the catastrophic mistakes Kentucky Republicans have made over the past few years, few have proven to be as disastrous as its failure to nominate a credible nominee for attorney general in 2003, instead of the crazy man they did nominate -- Jack Wood (R) -- who went on to lose to now Attorney General Greg Stumbo by six points. 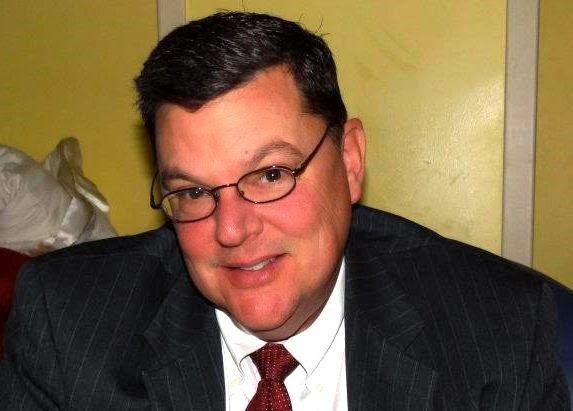 Well, Jack is back, and running for Family Court judge in Jefferson County hoping to join other crackpot family court judges like Tim Philpot and Debra Lambert. Four years ago, the Republicans took Tim Feeley - a good man - for granted, assuming he would be nominated as their candidate for Attorney General. He wasn't; Jack Wood of Valley Station was. This time Wood is running as a Democrat. Democratic primary voters should look toward Todd Hollenbach or Mike Weaver in this race. If Jack wants us to elect his daughter based on his word, not hers, then isn't it important to see what he stands for? We do not need more of the same selfish mentality in politics that this candidacy seems to offer. We have enough of that now with the Abramson machine and his lock step marchers in Bob Henderson, Rick Blackwell, and MaDonna Flood. If Jennifer truly wants an elected office in the future I would ask her to do one thing. Get involved. Who knows maybe if she is serious she could convince me to vote for her in a few years. But no way, no how, right now based on the word of Jack. We deserve better representation than what we get now and what the candidacies of Bob Henderson, Norman Pepper, or Jack er Jack's daughter Wood have to offer. ".......we believe the challengers are playing to the worst fears and suspicions of voters -- for example, arguing that local government merger has left these three constituencies worse off than they were before, even though merger has helped produce millions of dollars for area drainage projects, playgrounds, waterfront development, sidewalks and beautification." Um Courier Journal no one is playing up to the worst fears. The worst fears are part of the daily life. Government agency harassment by Code Enforcement that these idiots all love, and get help with from MaDonna Flood's lovely Chief of IPL husband convicted felon John Flood Louisville News and Politics: Code Enforcement: First in a series, is but one example of the Gestapo tactics Abramson cronies like Henderson, Blackwell, and Flood have been up to. As far as the millions of dollars beautification etc? Check out the Greenwood boat docks where a lot of money was spent on signs proclaiming what was going to happen and the project was abandoned and is now a weed infested nightmare. Check out the ethics violations by Henderson that his friend Blackwell cleared him of without even consulting federal testimony in the suit brought by Sarah Lynn Cunningham, a suit she won by the way, because of Henderson's illegal act. Perhaps you want to research the deal with Providence Group on the low income housing projects Henderson got them awarded and they then abandoned leaving sub contractors high and dry with monies owed to them. Maybe we need to ask businesses in Blackwell's District that have been harassed by John Flood, through his pet IPL harassment office for doing nothing more than showing support for Blackwell's opponents in races. Heck ask Blackwell's fellow teachers what they think of him never being there doing his job. Rumor from anonymous sources at the school say they do not like it and think he abuses the time off privilege. It would seem based on this he has a habit of not doing his job on both sides. Of course get someone on record who is not scared of backlash. That is the biggest thing the Abramson political machine has done. Created an environment of fear of repercussions to stifle dissent. Ask Jim King how effective that is. Maybe you would want to go to Preston Highway in MaDonna Flood's District and ask how they were treated after she won her seat and the abuse started against her opponents' supporters. The facts are that Blackwell, Henderson, and Flood are partisan hacks who could care less about their Districts but certainly profit from their job. They have accomplished nothing other than giving Abramson free reign to do whatever he wants so THEY could benefit or their friends could. They have not honored their commitment as Councilpersons to their Districts by putting their egos ahead of the job they were elected to do. "Our recommendation is that they re-elect Rick Blackwell in District 12, Bob Henderson in District 14 and Madonna Flood in District 24. In the six years since merger was adopted, they not only have gained knowledge that's useful in addressing the quality-of-life issues so many of their constituents are concerned about but also have built useful partnerships at City Hall and throughout local government." Most out here would sure like to see the "knowledge" that has been so useful to them. The only partnerships they have built at City Hall and local government have been useful to them staying in office and Abramson alone. Certainly not to the majority of the people they supposedly represent. The people out here are not folks who cater to the worst fears and suspicions. They want fair and equal treatment. They want the truth, not the lies and deception perpetrated by the Abramson rubberstamp machine of Henderson, Blackwell, and Flood, and backed by the Courier Journal. They want people who will truly represent them fairly and justly regardless of political party. Quite frankly these folks represent the worst of partisanship. They do not work well with others on any side and blindly follow the Abramson machine when the people of their Districts want leadership. Vote them out. Witten in District 12. Heuglin in District 14, and Weddle in District 24. This Council needs a change for the better not a continuation of the Abramson machine. Jim King Illegal Mailer for Katie? : OK I have to admit I saw this on some comments over at pageonekentucky.com Ready For This? Katie King Is In Trouble#comments. Allegedly Jim King's Bank, King Southern Bank, has been putting Katie King flyer's in people's mortgage bills. Talk about pressure huh? If proven true King has surely sunk even lower and probably illegally since his bank is federally regulated. I will pass this off as rumor for now but would love one of you faithful readers to send me proof. Being a regulated industry I am fairly sure that this would be another ethical, and very possibly illegal, campaign problem for the King's http://courts.ky.gov/NR/rdonlyres/4B1126C7-F694-413A-A1BF-4474C53AFA0D/0/JE116.pdf. If anyone has the proof you will remain anonymous. 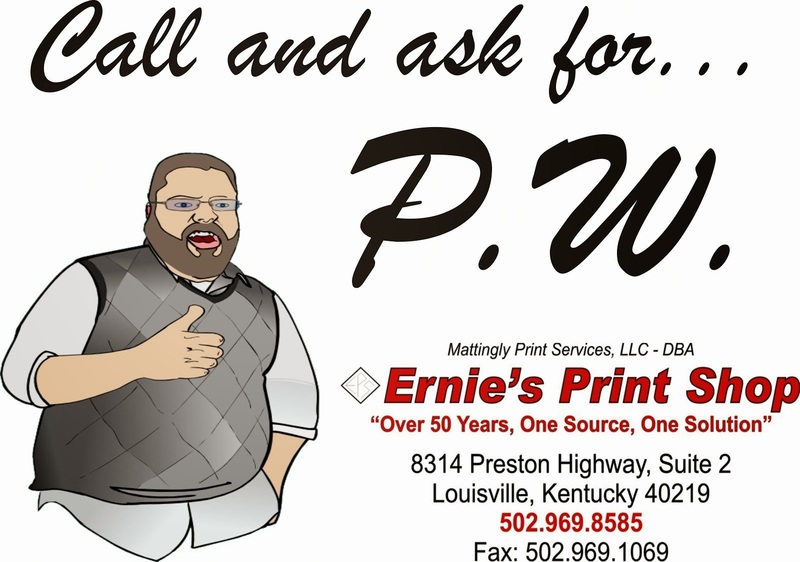 Please call me at (502)742-8519, or send me a copy at myviewmatters@aol.com. Another code enforcement debacle updated: Back in August I reported on a friend being thrown out of a public code enforcement hearing for having the audacity to stand in the back of the room so he could hear the proceedings better Louisville News and Politics: Another Code enforcement debacle. A clear violation of his rights was what I contended. "Summary: Insofar as the objective proof conclusively establishes that complainant was ejected from the hearing solely for declining to sit rather than remain standing in the back of the room, this office finds that a violation of KRS 61.840 occurred; the digital recording of the meeting confirms that such a condition was not required for the maintenance of order. The Board also violated KRS 61.846(1) in failing to issue a written response within three business days of receiving the complaint." Congratulations for making these folks accountable! Sign Update: Most of you know by now that Chris Thieneman put up a thank you sign for the hard work in stopping the form district change Henderson favors, though Henderson is acting like he had it stopped lying once again, for more read here: Louisville News and Politics: FORM DISTRICT CHANGE: ONLY DROPPED TEMPORARILY. Of course that sign was stolen almost immediately. Chris had a new sign made up and it is in the same spot. These children that steal signs need to grow up. Do you hear that Henderson, Mattingly, Wood? Of course this is just "speculation" on my part of who it may be. Speaking of signs: Want to know what happens when you put up a sign on someone's property they did not ask for and did not want? Check out the pic at the top of this article. Anne Northup decided she could go ahead and put that sign in this yard without their permission. NEVER do you do that. From what I have seen around the neighborhood her campaign has done that a bit since a few seem to be disappearing. Normally I would think they were being stolen but this pic says it all. If the candidates are going to think they have the right to use you and your property without permission make them pay for it. In this case, a picture is indeed worth a thousand words. According to some insider sources Ed Mellett, the "expert" that was conducting meetings on the form district change, has privately stated that this issue was dropped only temporarily until after elections in November. Apparently, the Abramson administration was concerned that it's rubberstamps on the Metro Council, Bob Henderson and Rick Blackwell, were having problems because of this change and they were worried they could not get reelected. Abramson needs these rubberstamps to continue denigrating the South and Southwest portions of the old County for his gain. Look for this issue to be revisited in the immediate future. Like we didn't know that would happen anyway. Coupled with so many other things it makes me wonder whether Katie A) Hates her Dad, Metro Council President Jim King, for making her do this or, B) if she is really that spoiled she thinks she can do anything she wants without repercussion. Either way she is in no way, shape, or form, prepared to be a judge of anyone. In the Courier today, who recently gave Katie kudos for her work (rolling eyes), as part of the Division 16 comments from her and David Holton, Katie King said she wants to bring a level of respect back to the courts, would like a separate domestic-violence docket to be created and wants to be a proactive and innovative judge King and Holton battle in Division 16 courier-journal The Courier-Journal. Bring a level of respect back to the courts? If they lack respect now this trainwreck called Katie King certainly would make it worse. I find it interesting her take on domestic-violence court like she is qualified to handle these type cases. Remember the 911 call when she was trying to break down her ex boyfriends door earlier this year? Wonder how impartial she can be with her history. Do not forget the drugs found in HER HOME in 2004 that her then boyfriend got arrested for though she got preferential treatment and off the hook. She wants to be a "proactive and innovative" judge? Sounds really proactive and innovative huh? She isn't mature enough to get to work because she has been out to late partying? She will do better being a judge with the added responsibility? I wonder how screwed up the court system will be when they have to continually reschedule cases because she just cannot get to work after partying all night. Think it is bad now? How much money will it cost from our taxes to have to redo dockets constantly and re notify anyone and everyone who is to appear. How many will slide through the cracks and get away with crimes because she just didn't feel like working that day to nurse a hangover. Maturity is important here and Katie King certainly is not mature in any way based on her actions and continuing troubled behavior. "I have tried to relay this information to Jason Riley at the Courier Journal, although nothing came of it. Katie began law school 2 years ahead of me. She was a 3L when I was just starting as a 1L. She started as a student in the Evening Division. One of the standard bread-and-butter courses law students must take and pass before graduating is Property Law, which is divided into 2 sections. The fall semester is Property I. The spring semester is Property II. Evening students take Property their 2L year. I found it interesting that Katie did not take Property I with my group of 1Ls, yet she magically appeared and enrolled in our Property II course. As a 3L, she should have already taken and passed the class. I recently asked a current Public Defender about this, who said that Katie had cheated and been forced to retake the class. I find that interesting because if I had cheated, I would have been expelled since my father is not a millionaire. " If there is any way to substantiate this information, I'd love to know. And of course as always the Courier did not follow up on this request. Katie needs professional help to learn how to judge herself. Not be in a job that judges others. Her dad, Metro Council President Jim King, apparently thinks we are all so gullible he can buy a Judgeship. I would think if he really cared about his family he would get Katie help not push her into this situation. Once again Henderson lies through his teeth and is now stating he stopped the form district change based on constituents concerns and he had many questions that needed to be asked. He also said he had problems at the FIRST public meeting regarding the district change on September 22. Sorry Bob it just does not add up again. FACT #1: The meeting on September 22ND was the 3rd meeting, though the first in this area, about the proposed change. Don't you even know how many meetings there were? FACT #2: Despite what the Courier-Journal reports, Henderson supported this form district change. At the public meeting on September 22 at the Southwest Government Center, Henderson publicly announced supporting heavy industry and manufacturing plants. Bob can you not get your stories straight at all? And of course backed by the press release his favorite rubberstamp sideman Rick Blackwell thanks him and says Bob did this. Blackwell is a patsy and have you noticed that he and Bob always support each other like it means something? Henderson claims that he asked Chris Thieneman to move the truck and refunded his campaign contribution. According to Chris that is a lie as well. Bob lied about the low income housing projects that were abandoned by the Providence Group, a group he approved of and made sure they got funding. They also received the funding then skipped town WITHOUT paying local subcontractors for the work they did. Thieneman removed the truck to protest Bob's lies and demanded the contribution be refunded. Bob didn't want the publicity so he refunded it against his will. Yet another lie and deception by Henderson. Voted for a 32% MSD rate increase, the largest in Louisville history. Henderson has been in federal court for his inappropriate behavior in District 14. Henderson has voted 100% of the time in Favor of Raising MSD rates! Henderson sponsored the failed LIBRARY TAX Scam that was soundly defeated by his constituents he is concerned about. He sure wasn't concerned about them then was he?. Henderson failed to notify the citizens living on Moorman and Orell Road that MSD dumped a combined total of 11 million gallons of RAW sewage into their neighborhoods above ground on April 4, 2008. This is totally unacceptable. Voted to bring in subsidized and Section 8 housing into our neighborhoods. Henderson has stated that we need at least 1500 more low-income housing units. He has allowed MSD debt service (mortgage) to grow to $2.8 BILLION, which you and I will have to repay through HIGHER RATES! Henderson supports another MSD rate increase before the end of the year. Henderson has given IPL (Inspections, Permits, and Licensing) the power to totally harass, intimidate and take away your personal property rights. Henderson has talked about bringing Vehicle Exhaust Test (VET) inspections back to Jefferson County. 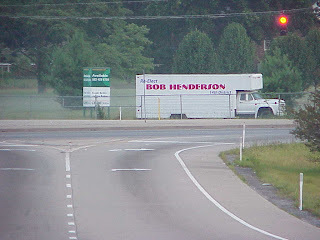 Henderson is responsible for the abandoned developments at Moorman Road and Dixie Highway and the abandoned development behind the PRP Fire House on Terry Road. Take a look at the unfinished Greenwood Road boat dock. What a mess, overgrown weeds and the project has been abandoned. If you look at Henderson’s council voting record on the issues, he does not represent us: Henderson represents the mayor and his group. If you, the voters want to make a change in District 14, vote him OUT. Also Henderson's lies about IPL are atrocious. He says he told constituents to call on the truck by Thieneman so there wasn't a conflict. Pathetic. Henderson doesn't mind calling IPL about anything and uses his friends to call for him on occasion. Either way it is Bob pulling the strings. A great example is when Michael Baugh, his pet IPL inspector, showed up during an interview with Bob by Rick Redding of thevillevoice. Just how did Michael know where they would be if there was no call? How well does Henderson and IPL get along? This idiocy that is Henderson has got to go. But make no mistake about it the field is crowded with people who have no clue in this district including Norman Pepper and Jennifer, or should I say Jack, Wood. Time for change in District 14 and District 12 on the Metro Council. This sign a problem? Apparently IPL thinks so and has sent an inspector to order it removed. 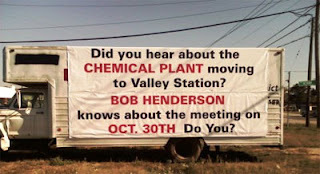 According to sources Bob Henderson does not like the fact that this truck is parked on Chris Thieneman property advertising a public meeting on October 30 regarding a zone change. So what do you do when you don't like something Bob or you get angry because someone stands against you? The usual of course get IPL to harass a property owner because you disagree with their politics. Unfortunately this particular sign is not political. The only political thing that can be inferred is that Bob knows about the public meeting on October 30. The interesting thing about this mess is Henderson only seems to care when it is someone else doing the same thing he does. For example check out the first picture and compare to the second. Notice any similarities? The 1st truck is the exact truck that was used in the 2ND pic. As a matter of fact if you look closely you will see the markings of Bob Henderson's name and the last part of District on the sign. 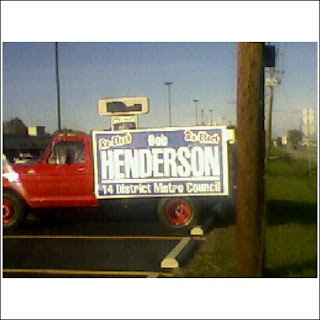 The banner was overlapped on the original Re elect Bob Henderson sign. The difference between the 2 locations? The first is facing the opposite direction of the 2ND at the same location on Dixie. The continual harassment by this hypocritical Councilman needs to be exposed. What is good for Henderson is good for us all. NO ONE is above the law and rules though Henderson clearly wants to believe he is. Yet another example of a political leader thinking he is above the law. Many have asked that I handicap the upcoming elections and who I support. My endorsements are in bold next to the race. Predictions are at the end of each synopsis. So with that in mind here we go. In all honesty this has been a bad year for Presidential nominees. I believe we certainly could have better candidates but I believe Obama/Biden's time has come. I believe the time for change is here. McCain appears to really have no clue and has seemingly sold out from the "Maverick" he tries to say he is from the one he used to be. While Bruce has baggage of his own Mitch McConnell's time has long since past. He is a dinosaur with either no clue or just plain does not care about the people anymore. He has sided with this disastrous administration that has destroyed the financial basis of this great Country and eroded the moral fiber lower than I have ever seen. Bruce may have baggage but he would be a fresh face at that level. A nail biter but McConnell wins by 2%. Anne has had her time and in all honesty I just never got her. She always seemed to be a follower not a leader and her campaign tactics have always left me turned off. Yarmuth on the other hand has pleasantly surprised me. He is doing a good job overall and spends more time here with We The People in his first term than Anne did in all her years. As long as he continues being in touch he will have my support. Many have portrayed Doug as someone who just likes to stir the pot for his own ego in the media. I disagree. While no doubt many like the media attention in politics Doug has genuinely tried to make even the most mundane subjects of his district and the Southwest overall relevant. He has withstood the criticism and continued to fight the fight. Perry Clark has been relatively quiet this term and some think his heart just isn't in it. One person I spoke with when I asked who they supported in this election did not even know Perry's name. Not a good sign for an incumbent. While I think both can do a good job the time is now for change and I believe Hawkins is the one to accomplish that. What can I say. Henderson is a puppet, Pepper doesn't even know if he is a registered Republican or not in the primary, and has yet to speak of anything other than the price of wheat and corn in his campaign. Not one thing a Councilman can do about that. Jennifer Wood has no experience whatsoever to draw on. Her dad Jack Wood does all her talking for her and it is impossible to find out what she really stands for. As her campaign manager extraordinaire Jack Wood has only pushed one agenda and says publicly that she will win because she is a pretty young female. That campaign tactic does not address the issues this area faces. Not the best choices overall IMO. Shake is as political as they come and a political insider in my opinion and this job is supposed to be impartial. Abramson has done some good things overall and I believe she has more integrity. I have to admit I believe either candidate here will do a pretty good job I support Kemper based on my talks with him over the last couple of years and his record. His time has finally come in my opinion. I will not go against the Citizens for Better Judges on this one. Anne Bailey Smith has more courtroom experience and that matters. Once again Citizens for Better Judges like Mr. Bowles and so do I. 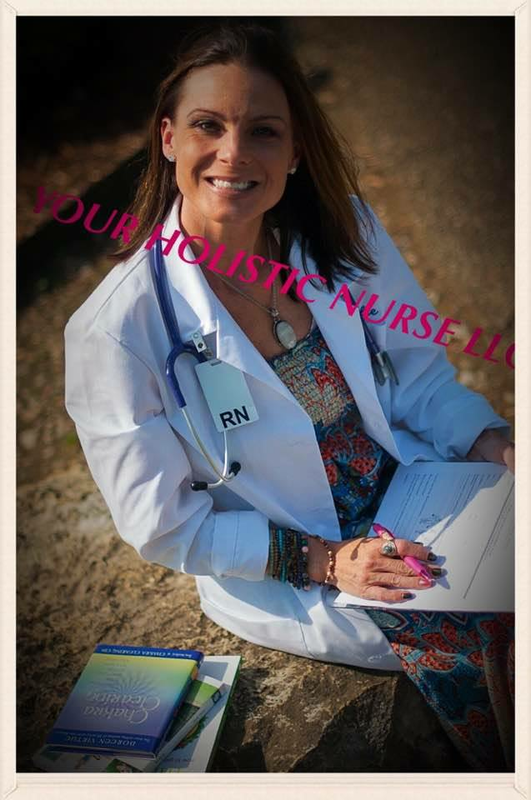 A former Jefferson County Police Officer, private practice experience, and the son of a former Judge. It is in his blood. He can see both sides of the issues with his experience in law enforcement. I will give the edge based on that. This should really be a no brainer and David ordinarily would win this handily. In this case though Katie King is using daddy's money to buy an election she has no reason to be in. Katie has all kinds of accusations against her right now including a 911 call with drugs in her home in 2004, a recent one earlier this year for harassing an ex boyfriend, and has even been found guilty of ethics violations in this campaign. This immaturity is not something we need on the bench judging others. David is an experienced guy, extremely intelligent, even tempered and ethical. He is the one other judges would come to for help even before he was appointed the seat until election. He is the man for the job, however, the KINGdom will spend whatever they have to spend to get Katie in. These are my endorsements, opinions and predictions. KATIE KING: Are you serious? As many of you are aware by now a letter has been circulating in regards to Katie King and a 911 call at her home in February 2004. I received the same letter as many media outlets did. I decided to wait a couple of days before writing to analyze and dissect the letter. Anyone with info on Katie King or any other story can always reach me at (502)742-8519 or write to me at myviewmatters@aol.com. You can read Jake over at Page one for his take on it here: New Katie King Letter in the Mail. This story is one that began back in July as I wrote about Katie and her "experience" then Louisville News and Politics: Katie King for judge? Funnily enough the mainstream did not really want to do any in depth reporting on the KINGdom. The courier journal finally did do a quickie piece in this article this week: '04 pot bust in candidate's home courier-journal The Courier-Journal. There have been many continuing allegations of drug use including cocaine abuse by Katie in the past and the present. I am curious why Katie was not arrested in February of 2004 for having drugs and paraphernalia in her home. If anyone was in this situation they would have also been arrested on the spot. It was HER home, there was pot in more than one area, and it was her responsibility accordingly. Personally I believe a random drug test by an outsider would calm most of these rumors of her present drug use but of course that will not happen. Most employers allow random drug tests based on suspicion. In this case we are expected to think that someone with little experience in law, has never tried a case herself, and has some serious issues to deal with apparently is to be trusted to pass judgement on anyone else? Katie has already been found to have ethics violations during this campaign: http://courts.ky.gov/NR/rdonlyres/4B1126C7-F694-413A-A1BF-4474C53AFA0D/0/JE116.pdf. This in addition to allowing her campaign to issue a false statement on behalf of her ex boyfriend Michael Detenber he did not approve. If we are to be Katie's employer is she above the law? Are we going to lower our standards by allowing her to pass judgement on others when she has ethics problems already? If she cannot follow the law how can she effectively judge others for disobeying it? Hypocritical perhaps? Do as I say not as I do. Therein lies the problem. I prefer trust in our Judges. I prefer they have experience, values, morals, and ethics. You bet. But if I am going to be judged I certainly want to know the one judging me is at least competent. Not bought by daddy's money. Based on the lies from Katie about her experience, her ethics violations, her dishonest issuing of statements on behalf of an ex boyfriend, and her general disregard for the law certainly tells me we can do much better. Do not be fooled by daddy's money and his interest in his KINGdom at our expense. This story has provoked such a response from readers, and Ray Crider himself through a Republican intermediary, that a second part was necessary. I spoke with Mr. Crider today for his version of events and they went pretty much as I expected. Ray states that yes he did confront Thieneman and explained to him that he needed to purchase a booth in order to qualify passing out literature and that he was in no way trying to stop Thieneman and his group. He was only interested in them abiding by the rules of the festival. He cited a couple of examples of others in noncompliance such as Katie King who did not have a booth and when asked to purchase one to be legal she said she would get the money and be right back. Of course she never came back. Funny you would think she could afford the $150, or I'm sorry, her daddy Metro Council President Jim King could. Another example of fairness was asking Anne Northup to quit putting stickers on everyone who walked in if they did not ask for them. The reason is that this was offensive to the patrons. I agree. Anne should not force herself on those there for non political reasons. One example of altering the rules was to allow Norman Pepper to come in early and set up his hay wagon he uses to sit on properties around town. Though technically not allowed Pepper was told to put a skirt around it so the wheels would not show and not to get on top of it like a podium. In effect it was designed to make Pepper's wagon look like a sign which would be acceptable within the rules. According to Ray, Chris Thieneman had never applied in advance for a booth nor did he offer to purchase one at the time. Ray says there were 10 booths available for rent and he would have gladly taken the money on behalf of the festival. According to Chris Thieneman, and witnesses, he did offer and Ray refused saying if he did purchase a booth he still would not be allowed to walk around the event he would have to stay within the booth. This in itself would contradict the rules since political candidates and other booth holders were allowed to walk through the crowd. Here is the WAVE3 story from last night: http://www.wave3.com/global/video/popup/pop_playerLaunch.asp?vt1=v&clipFormat=flv&clipId1=3018461&at1=News&h1=Group . According to the rules cited to me by Mr. Crider all political candidates must purchase a booth in order to pass out material or literature. Fair enough. In this situation, however, Chris Thieneman is not a political candidate and since the event was partly financed with our Metro tax dollars, as approved by the Metro Council June 12, 2008 (NDF060508SCFPC - $5,000 TOTAL FROM THE 12TH, 13TH & 14TH DISTRICT NEIGHBORHOOD DEVELOPMENT FUNDS TO SOUTHWEST COMMUNITY FESTIVAL & PARADE COMMITTEE, INC. FOR PROGRAM EXPENSES), it can and should be labeled a public event on our publicly owned property and therefore Thieneman was within his rights. The sponsorship lists of the Festival also lists as Gold sponsors Rick Blackwell, Bob "rubberstamp" Henderson, and Doug Hawkins. Our tax money approved, as it is for generally all festivals so no complaints here, was used in part for the festival to happen. Does this make a compelling case for a violation of 1st amendment rights? In my opinion it does. Thieneman has a valid case to pursue for violation of his rights based on public funds being used that would in essence consider the festival a public financed event and therefore outside of just the festival own rules. Public tax dollar funding on public owned property is a strong signal that yes Thieneman had a right. While I do not doubt the sincerity of Ray Crider, or Chris Thieneman, I do believe that there is a gray area here that needs addressed and I believe Chris Thieneman has a case. In most cases there are 3 sides to every story: yours, mine, and the truth. Regardless there are questions to be asked here and answered in relation to rights. One thing I would however ask is this. Do not go overboard getting accountability at the expense of these festivals across the City. The festivals are a good thing for our areas and a great way to interact with each other. Let's just make sure we treat all fairly and equally regardless of whether we agree with the messenger or the methods. Saturday was the Southwest Festival at Sun Valley Park off Dixie Highway. Many of you already know that Sun Valley is a Metro Parks PUBLIC place. With this in mind of course every politician was in force passing out literature and lying to the voters as usual. Even the Mayor was there to support his Democrat rubber stamps. Around 11 am or so a group showed up dressed in Halloween costumes. One dressed as Santa Claus complete with a young one beside him walking through the crowd. The young one had one of those "Eat at Joe's" type signs hanging from him which said on the front: "All I want for Christmas is......" with the back showing "a new Metro Council." A second person was dressed as a bad clown with writing that simply said: " I am Clowncilman Henderson Vote me out of office." And finally a third was dressed up as Osama Bin Laden with literature to pass out concerning the new bomb shelter facility on Cardinal Hill water reservoir out here being a terrorist thing. Someone got creative in protesting to say the least. It is about time really. Since the Mayor didn't like it, and no doubt Bob "rubberstamp" Henderson didn't either, the Mayor and his cronies decided the protesters must leave so they had 5 police officers remove these people from the premises. This is a clear violation of civil rights and free speech rights. Once again this Mayor decides what is allowed and is not in regards to free speech. This is a public park paid for by our tax dollars and we have the right to assembly regardless of what the Mayor wants. To use the police to violate these rights is a direct problem for myself and many others who believe our rights are defensible. From what I am told the event organizer was even screaming and yelling at these folks using language that sailors would be proud of. Of course using it in public in front of people and assumedly kids doesn't inspire me that this organizer really cares about much. It is pathetic that this Mayor and his political cronies have decided they have the rights to abuse ours. When we are not allowed to assembly on property we paid for then we must stand up and say no more. There was no reason to force these folks from the Festival and off the property other than the fact they stood up against the politicians who are allowed to go wherever they want, and do whatever they want, without fear of confrontation. They were harming no one. One more pathetic abuse of power by this administration. I hope these folks file suit for civil rights violations. This Mayor and his pet gestapo enforcers need to be held accountable. While running against Abramson for Mayor in 2006 I took a stance against the arena. While an unpopular one admittedly I still to this day believe it was the right stance. I compared the available Loeb and Bonham group reports and reluctantly agreed that if we were going forward regardless that the Water Co. site made the most economic sense. It provided better parking, easier access to 4th Street live and a general better feel than the LG&E site. Forced to make a choice of location I backed Schnatter and Jones then as I do now. Of course, this Mayor and cronies would not hear of anything but their chosen site by their chosen one the Mayor himself. The argument was that a new arena would bring all these mega bucks to our Downtown and our entertainment district. Namely 4th Street Live. A vibrant downtown would help the entire community with new dollars etc blah blah blah. Cheer leading has never been a problem for Abramson. It probably is the one thing I think he does well. The problem is cheerleaders do not win games and make no mistake about it the game of life is a game we all play to win. With this in mind I have been against 4th Street live and the fallacies within. Race discrimination, bullying of people the district feels do not fit into their vision, and a company that generally does not fulfill its promises to the Cities it enters agreements with. There is much information on Cordish Group available and much of it is very negative from other communities who bought into their hype. Fact is Cordish deals benefit one group exclusively in my opinion no matter the cost to the communities they enter. "The whole project is expected to create 9,400 full-time jobs. The Cordish group has agreed to hire preferentially from the high-needs neighbourhood in the immediate neighbourhood, facilitate apprenticeships with local unions, and use unionized labour." Of course the Cordish Group has not been so accommodating to our local unions have they? I could spend hours on this but the bottom line is a simple one. These guys do not care about the communities they enter into they care about their bottom line. We continue subsidizing these guys with tons of free money that we essentially have to get somewhere. That money comes from us the taxpayers period. Do we want to continually finance the well being of a select few like Cordish Group with no guarantees by them with their own money? I do not think so. Based on the information available and the problems Cordish Group has in other areas that are similar to us, do we want them to be the representatives for us in a Downtown community? Do not forget either that this Mayor has spent merger doing nothing for the old County residents so they get their money's worth. Backed as always by his pet monkeys Rick Blackwell, Vickie Welch, and Bob Henderson. We have spent almost a billion dollars backing this Mayor and his cronies for their vision not ours. We have encountered constant delays due to financing and a credit crunch. We continue losing good paying jobs in our community for lesser paying ones. All blamed on the economy of course. With less money coming in lieu of wages and tax revenue overall how can we the people afford more of Abramson's only vision and his mantra "if you build it they will come. " These delays have one thing in common they are all financial delays based on a poor economy and lack of available money. Now we want to give the Cordish group a $38 million giveaway for a guaranteed $12 million return. With no money and constant delays at other funded projects does this seem smart to any of us? Any ideas what we could do in our community with the other $26 million? Let's stop this Mayor giving away our money like it is his own. Call 3-1-1 and tell your council person to get over partisan politics and do what is right for all of us and keep The Cordish Group out of here. Some say it probably isn't smart to antagonize the big boys. The way I see it you antagonize the bad boys by holding them accountable and deal with the consequences regardless of size. I have taken my share of hits and misses in my day and will continue to do so just ask the Mayor and his cronies. The Courier lost my respect a long time ago. They refuse to do the type of in depth reporting many of you see on this blog, and other Internet sources, though the stories are factual and we all share a common bond in our community to gain accountability through transparency. I miss the old days of the Bingham's at the Courier and still remember the evening edition of The Louisville Times. When real news broke it made the evening paper. A once proud paper with a stellar reputation across the Country has devolved into this local "Enquirer" mindset of journalism. Their choice I guess but sad nonetheless. Which brings me to this. I have known for some time the Courier is hurting for readership. I was very surprised today though to see just what lengths they would go to to get them. This evening while catching up on the news before I headed to work there was a knock on my door. Turns out it was a Courier Journal salesman. Never mind I have a No Solicitation sign on my door to keep salespeople from bugging me all the time this person felt it necessary to interrupt my evening news to tell me about the great deal the Courier had for me. If I would just take this absolutely free Courier Journal paper he was trying to give me and sign something or other I could get the Courier free for one month! Great deal huh? Depends on who you are I guess but the problem was he had 3 young kids with him ( I am guessing middle schoolers), to help with his sales pitch. Apparently if I would sign and agree to receive the paper these poor kids could go to Kentucky Kingdom or Kings Island or something. Does this seem funny to you? I always expect kids to come knocking on my door for the latest school fundraiser and I always support them with my donation. I expect girl scouts to knock on my door wanting to sell me cookies. I buy them. This is acceptable and directly goes to the kids and their school function but a business like the Courier using kids for their subscribership and profits? Sorry it sent the wrong message to myself and my neighbors. Since when has it been acceptable to use kids for a business like the Courier Journal. Are they that hard up they have to resort to the "do it for the kids" approach to get subscribers? I have a suggestion for them. Quit trying to use the kids because you are too lazy or too cheap to actually do in depth reporting. Quit playing politics and go back to the days of Edward Murrow, or Walter Cronkite, and actually be journalists for a change. Quit being an Abramson cheerleader and start working for the people who want to know the truth about our government and our local stuff. Bottom line find your journalist integrity and make a once proud paper be recognized again. Don't prey on our sympathies for children to get your profits. I and all the lost subscribers you have only want you to do one thing. As many of you know the recent wind from Hurricane Ike crippled our community in many ways. Over 300,000 without power, some for as much as 10 days, and major damage from fallen trees and debris. Not to mention the number of homes completely totalled or needing serious rehab work just to live in them. First I would like to thank ALL the emergency crews and Lg&E personnel for their great efforts during this time of crisis in our community and the endless hours they put in working to restore basic services for us all. I would also like to say thanks to all the citizens in our community for their efforts as well. It has been a long time since I saw so many people work together. Neighbor helping neighbor enemies now friends. It was a lesson that indeed we can all work together when necessary. Mayor Abramson in his infinite wisdom decided he would help with debris removal in the Louisville city limits as usual but would not do anything for the County people. If we are to be one community why then does he continue to act like merger never happened and chooses to ignore the County people. Today a few weeks later I still see trees down everywhere, debris that has not been cleared, and people asking, even begging, for help with no response from this Mayor other than to say sorry that is your problem. It is a pathetic example of his leadership for the WHOLE community. While I understand that this was a serious situation, and one unforeseen here, I also believe the Mayor dropped the ball by bragging about how many people were working together in this community while at the same time not working for all he was elected to represent. It was a blatant hypocritical moment and one we have come to expect from this Mayor. Of course we have come to expect that from his cronies as well such as District 14 Councilman Bob Henderson, District 12 Councilman Rick Blackwell, and District 13 Councilwoman Vicki Welch who voted against an emergency ordinance to help County residents with debris removal. These people were elected to represent the County residents in their districts and have failed miserably in this regard. In an emergency situation we depend on our leaders to help us. By voting no on this ordinance they said hey we are better than you help yourself. Do they deserve reelection for ignoring the people of their districts in times of crisis?